The Article 370 of the Indian Constitution gives special autonomous status to Jammu-Kashmir (i.e. India-administered Kashmir) and the United Nations resolution of 13th July 1948 used the phrase ‘future status’ of Kashmir, which was an indication that Kashmir could potentially become independent. However, upon the request of Pakistan, the resolution of 5th January 1949 restricted the choice of Kashmiri people in choosing to join either India or Pakistan and therefore, it made it impossible for Kashmir to become independent. Furthermore, UN Security Council adopted a Resolution 91 in 1951. While the first part of this resolution that deals with announcement and implementation of ceasefire and demarcation of a line dividing the territories of India and Pakistan took place, the second part concerning demilitarization of the area and free plebiscite has never been implemented. The Shimla accord between India and Pakistan signed in 1971further limited rights of Kashmiri people by stating that India and Pakistan will decide what the future status of Kashmir would be. There were two wars over this territory, one of which followed the partition in 1947 and the second one in 1965. However, there are frequent clashes over the militarized Line of Control dividing the territory between India and Pakistan. A serious outbreak took place in 1999, when Pakistani troops and Pakistan-backed rebels invaded the mountains on the Indian side of Kashmir. After all these wars and clashes a relative peace was established and 2003 ceasefire agreement was signed. India regards Indian-controlled Kashmir as its own and Pakistan views Kashmir more as a disputed territory. Although it seems that the fight for independence is still alive on both sides, separatist attempts are more visible on the Indian side of the divide. In the Indian controlled territory of Kashmir, there is a Muslim majority (over 60%), which means that locals would prefer to acquire independence or be controlled by Pakistan. A fact reflected by the number of votes for independence. However, India considers the area to be strategic and it worries that granting Kashmir independence could inspire other separatists living within Indian borders. Moreover, human rights abuses do not take place only exceptionally. There is no doubt that the Indian military presence in India-administered Kashmir causes a great number of these incidents. The Kashmiri human rights organization “Coalition of Civil Society” claims that there were 168 government-ordered killings carried out by the Indian army since 2002. Mirwaiz Umar Farooq, points out that in spite of the fact that the international community turned blind eye on Kashmir, the issue of Kashmir is still pending and it can only be resolved by the third party intervention by assistance, mediation or involvement. The position of the European Union (EU) is reflected in the words of EU Ambassador to India Daniele Smadja after meeting with Mirwaiz Umar Farooq: ‘We are not coming here with a particular mandate (to solve the issue). What is happening in this part of the country has to be solved by the people who are living in the region.’ Therefore, it seems that greater involvement of the EU could be a step towards resolving this never-ending crisis. There is one good aspect of all sad stories, which is the fact that they eventually end. Conflict, human rights abuses and denial to grant independence are indisputably unhappy moments in the story of Kashmir. Nevertheless, the most tragic issue is the story’s length and the extent to which this crisis is overlooked by the international community. Shabir Choudry, “Legal and Constitutional position of Kashmir”, J&K Insights. 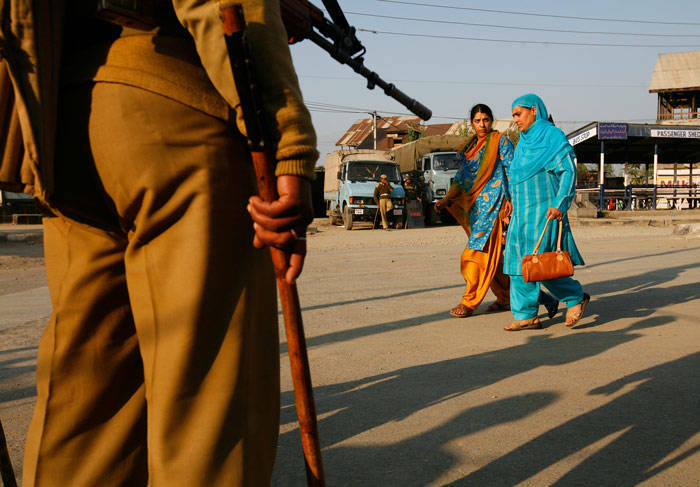 “India: Kashmir Separatists Active in Forgotten Conflict” Asia News Monitor, 1 October 2013. Constitution of India 1949, art. 370. Choudry,“Legal and Constitutional position of Kashmir”. “Indian-administered Kashmir people observe Black Day 27 Oct” BBC Monitoring South Asia, 27 October 2013. “India accuses Pakistan of fresh attacks on Kashmir border posts”, The Guardian, 23 October 2013. Ashmed Rashid, “A New Conflict in Kashmir?”, The New York Review of Books, January 15, 2013. “India accuses Pakistan of fresh attacks on Kashmir border posts”. “Q&A: Kashmir dispute”, BBC News Asia, 7 August 2012. Zahid Rafiq, “India offers another investigation to calm Kashmir”, The Christian Science Monitor, 21 July 2013. “India: Kashmir Separatists Active in Forgotten Conflict”. “Indian-administered Kashmir people observe Black Day 27 Oct”. Hilal Ahmad Wani, “The Role of Civil Society in Conflict Prevention in Jammu and Kashmir”, International Journal of Business and Social Sciences 2(2011):162. Rafiq, “India offers another investigation to calm Kashmir”. “Pak committed to peaceful solution of Kashmir dispute: PM”, Financial Daily, 5 February 2013. Suhas Chakma, “India’s global human rights advocacy: hamstrung by Kashmir and Cold War syndrome”, Open Democracy, 6 November 2013. “Pakistan: ‘Free Kashmir’ Far From Free”, Human Rights Watch, September 22, 2006. “European Union not to interfere in Kashmir issue”, Rediff News, May 13, 2011. This entry was posted on 21/11/2013 by ISIS Europe in Behind the headlines, Nina Levarska and tagged Conflict, EU, India, Kashmir, Pakistan, UN.